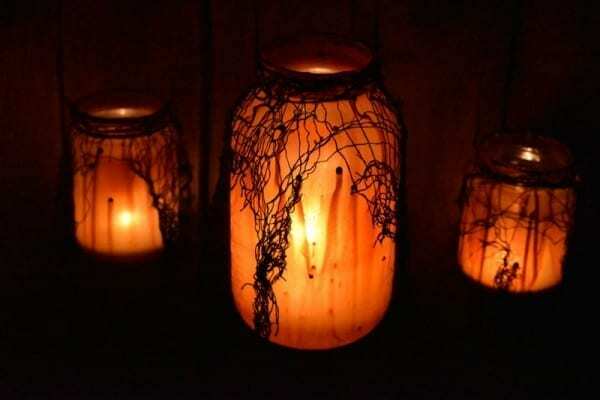 These spooky witch lanterns give an eerie glow in the cold, dark night. The flames from the candles flicker as they dance inside and illuminate shadows that you wish weren’t there. 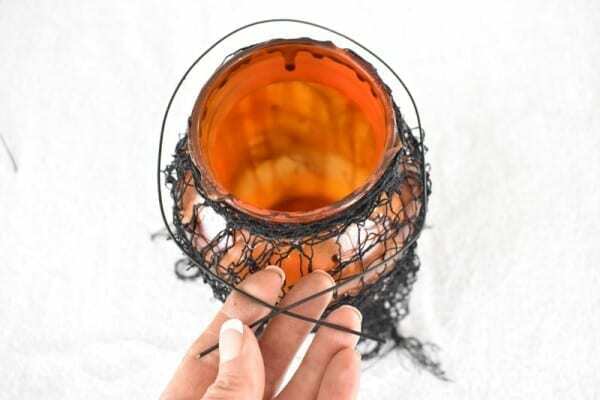 What an awesome projects this is, both fast and easy to make. 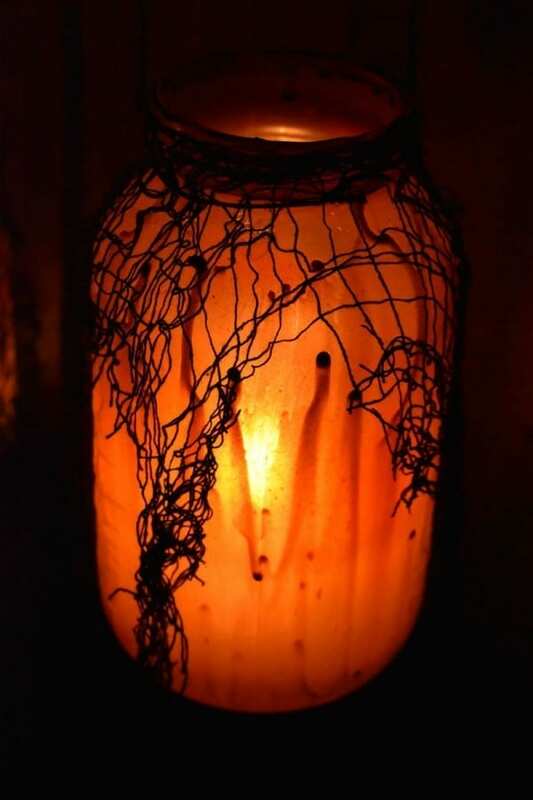 These lanterns will illuminate anywhere in your haunt that needs some extra spookiness! 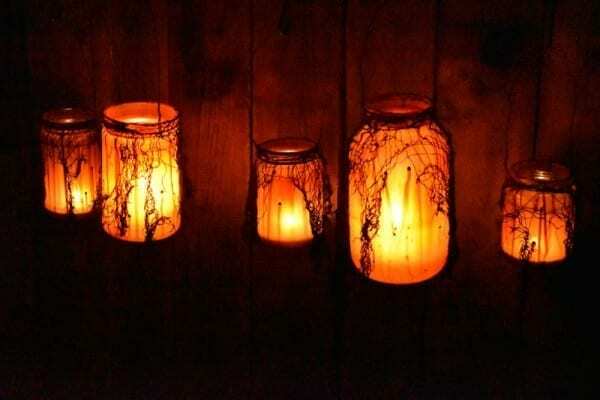 Although I hang these lanterns in my witch room, you can also use them as pathway markers, or hang them on your front porch to create a creepy atmosphere. They give out just enough light to see the flickering glow, but leave plenty of shadows for your imagination to wander. 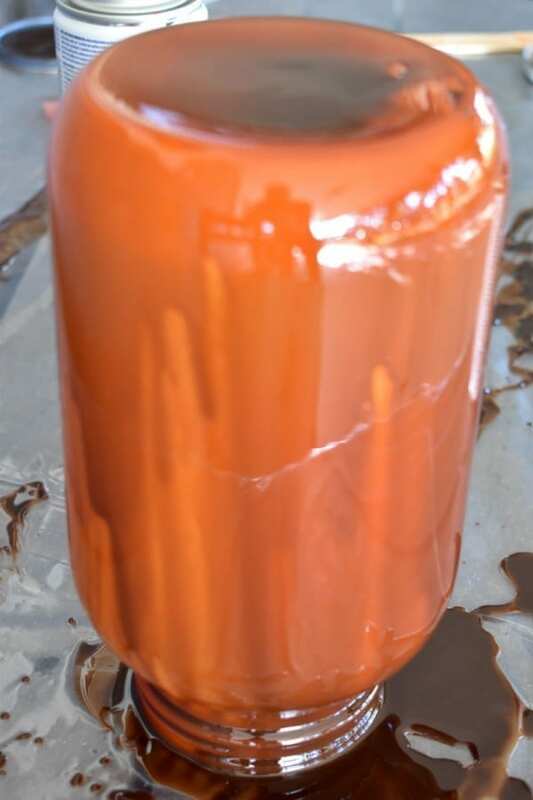 Polyurethane with combined brown stain (I used an oil based one but a water based one would work fine also) If you get a matte polyurethane instead of a gloss, you won’t have to put a matte clear coat on when the jar is finished, to get rid of the glossiness. 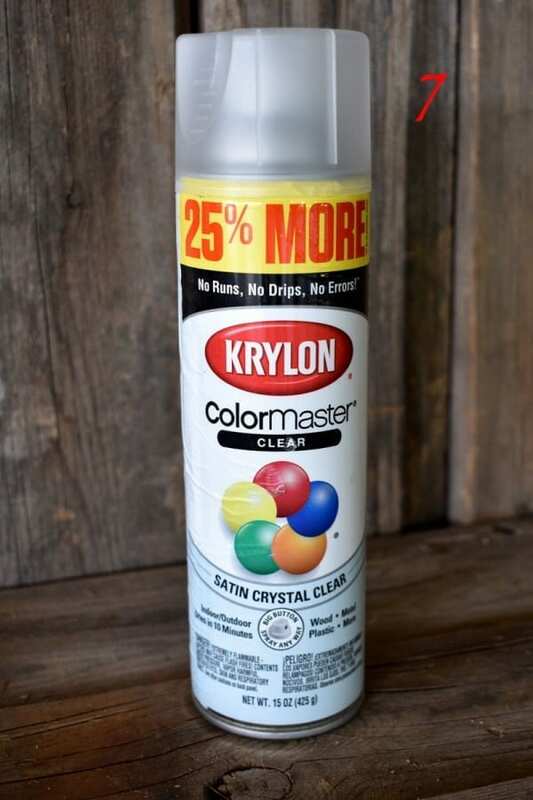 Matte Clear coat (you’ll only need this if you use a gloss polyurethane instead of a matte one) This basically gets rid of the glossiness and makes the jar matte. 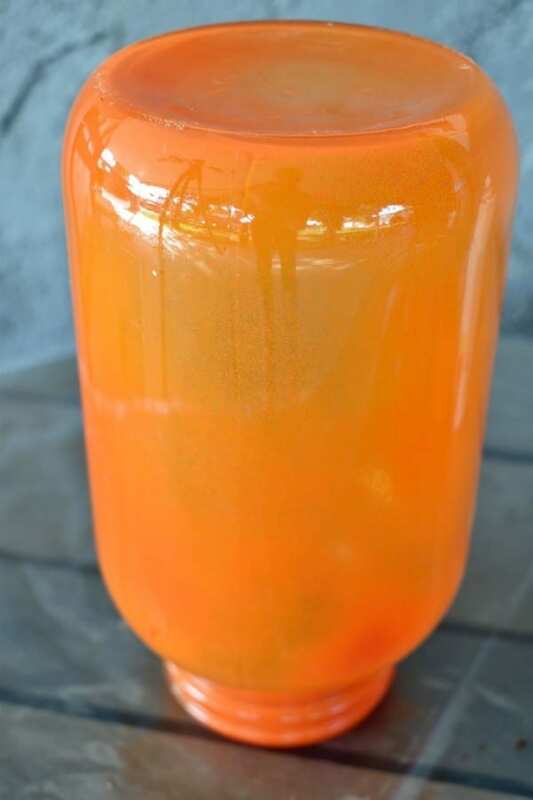 Gather the jar and the orange spray paint. 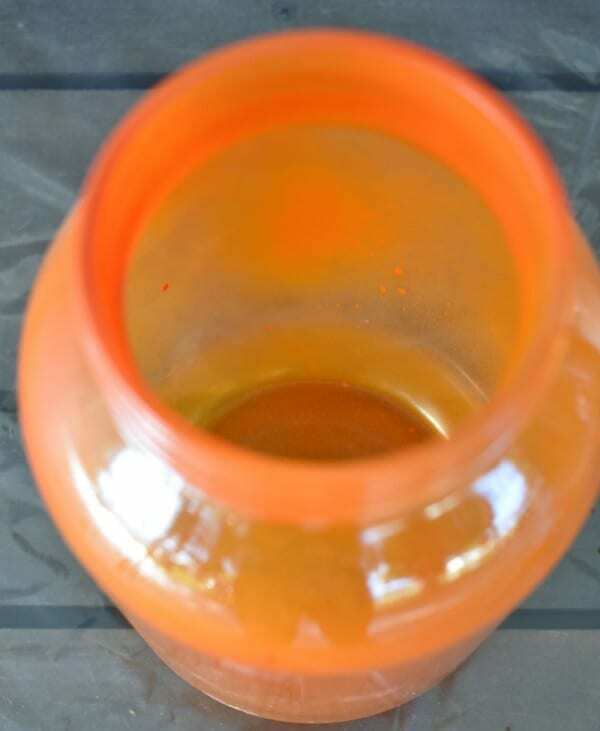 Spritz a light spray inside the jar, but don’t add too much as you want to be able to still let light through the glass. 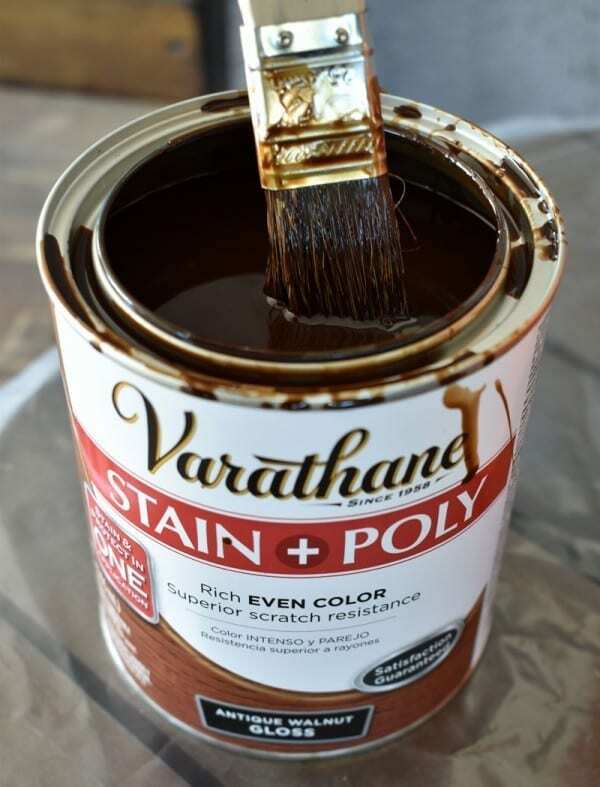 Gather the polyurethane and paint brush. 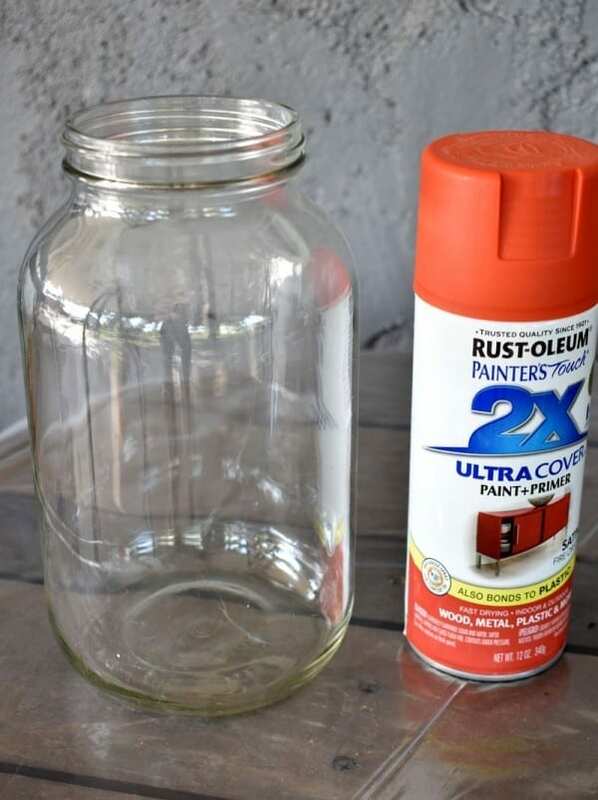 Paint a coat all over the jar. Don’t worry if it’s not an even coat as the drips and a sloppy look makes it look better! 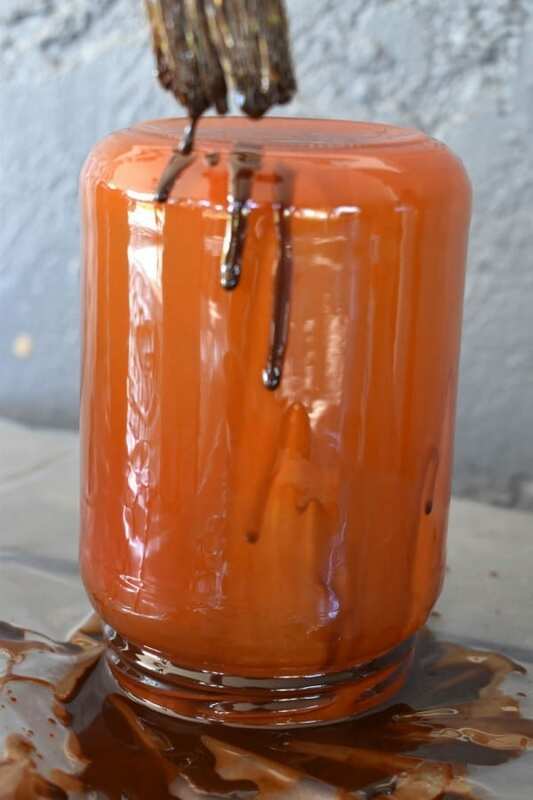 Let it dry for about 5 minutes, then go back and drip some more polyurethane down the sides. Let it all dry. 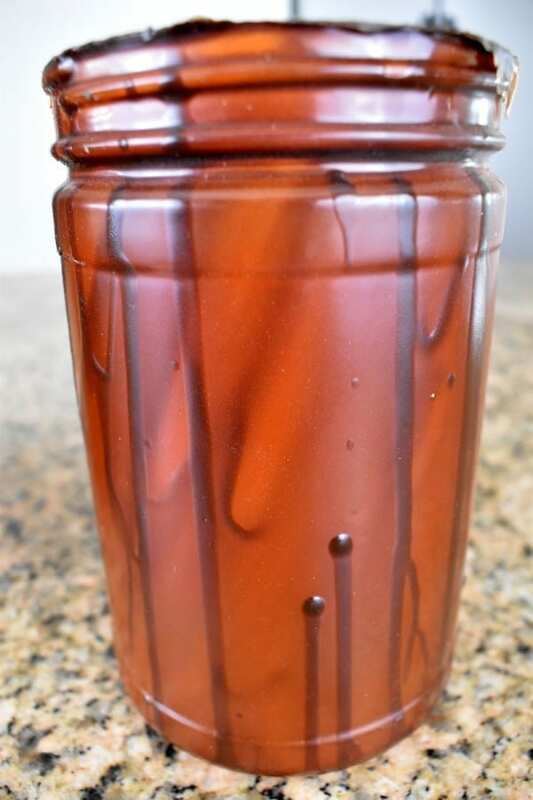 At this point I realized I used a gloss polyurethane instead of a matte, so I spritzed my jars with a matte clear coat to get rid of the glossiness. 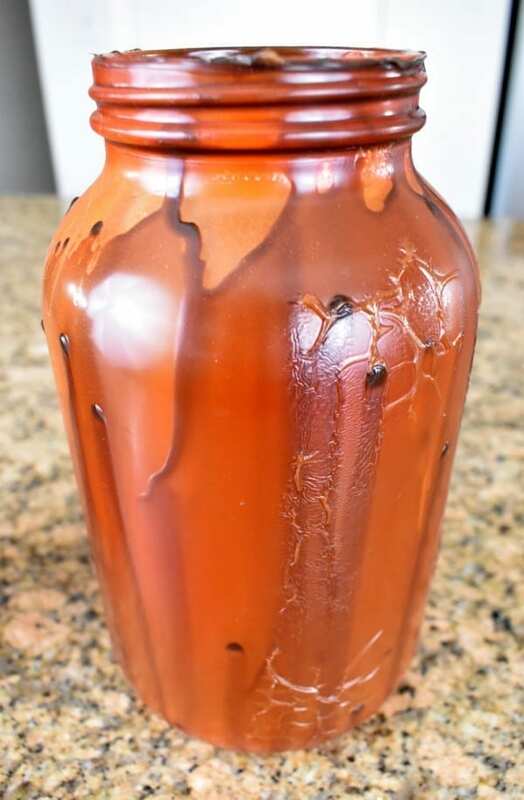 I didn’t let this jar dry enough (shown below) before spraying on the clear coat, which ended up giving the jar a cracked and mottled look in spots. At first I was upset about it, but then I realized it only added to the gross, creepy effect! 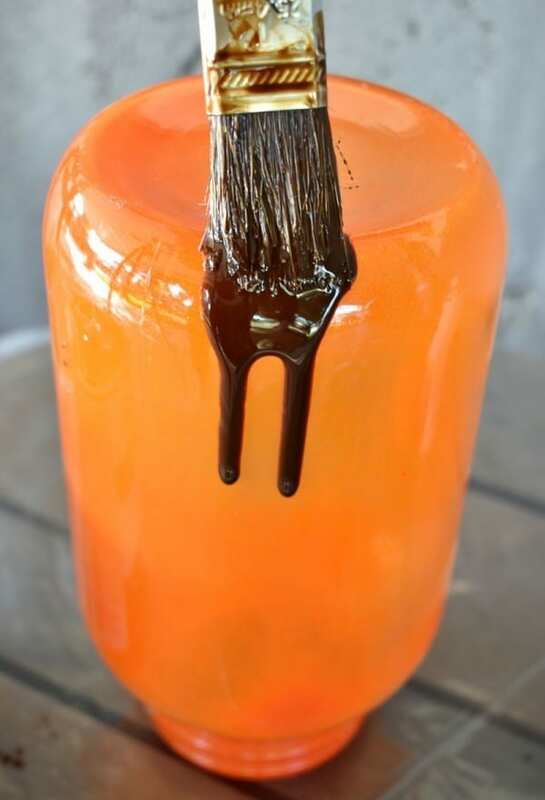 So take note…if you don’t want this look, make sure your jars are completely dry and cured (at least two or more days) before adding the clear coat! 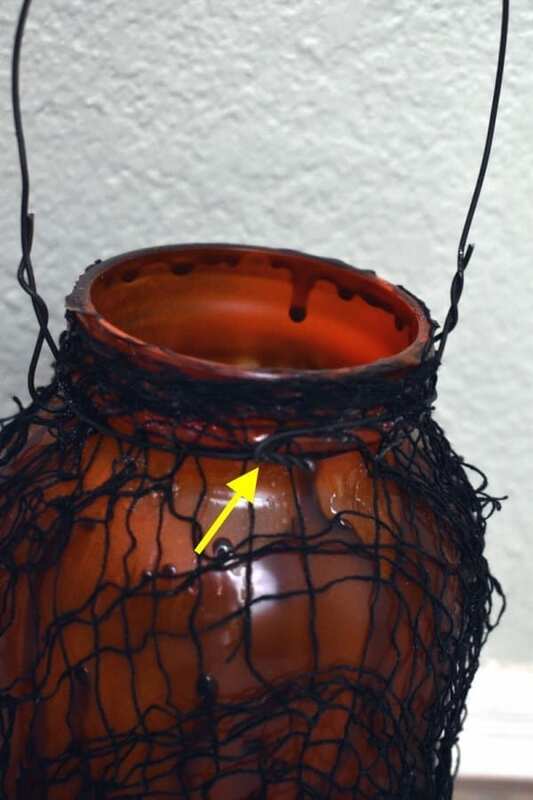 Add the fabric onto the jar before the spray adhesive dries. 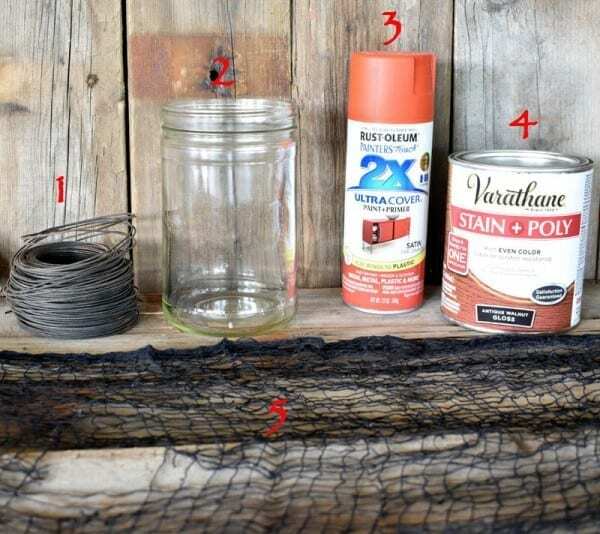 (You can trim the ends so it looks stringy and jagged). 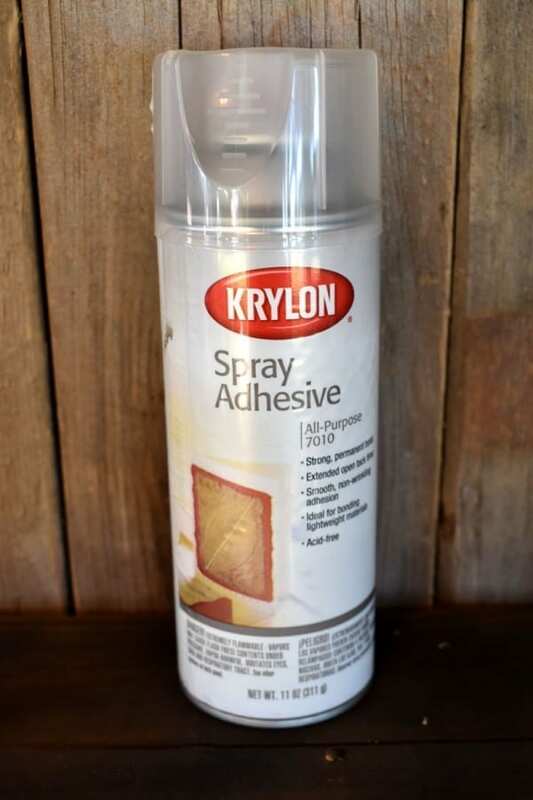 After trimming, I spay the whole jar one more time with the spray adhesive to give the fabric an even more stringy-look. Gather the wire, wire cutters, and pliers. 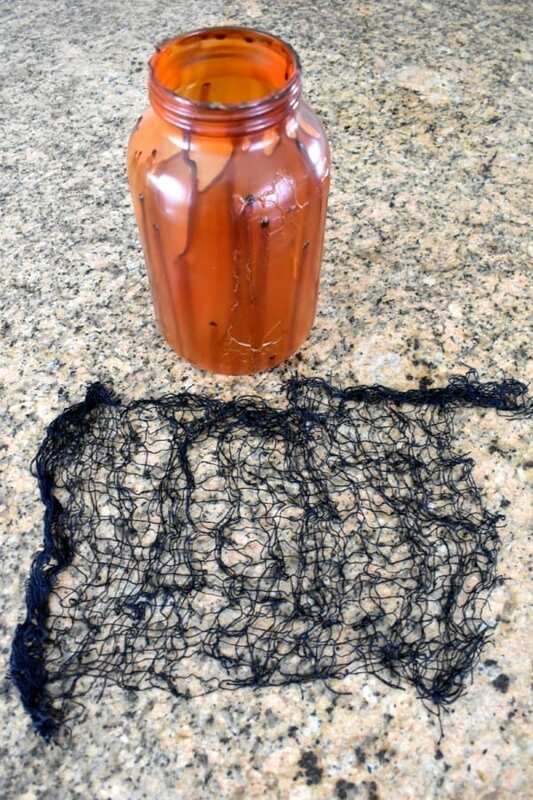 Cut a piece of wire that will wrap around the neck of the jar. 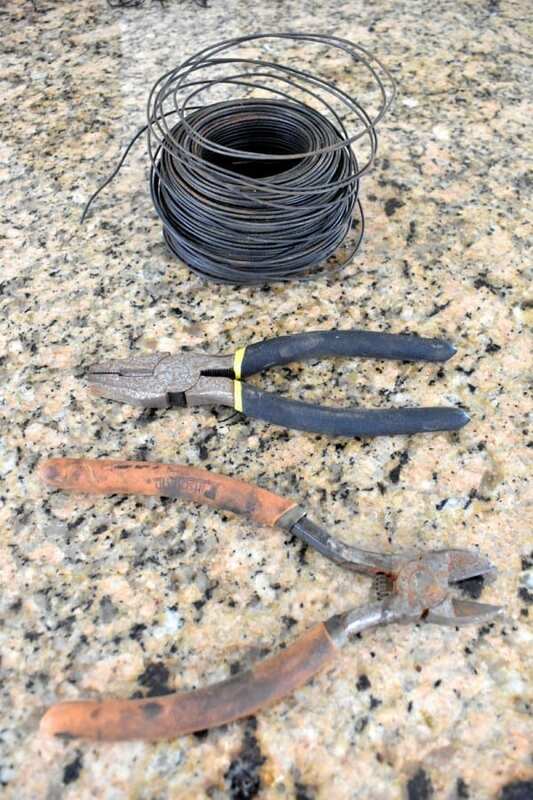 Twist the ends around the neck, leaving the wire a little loose so that you can easily add the second piece of wire. 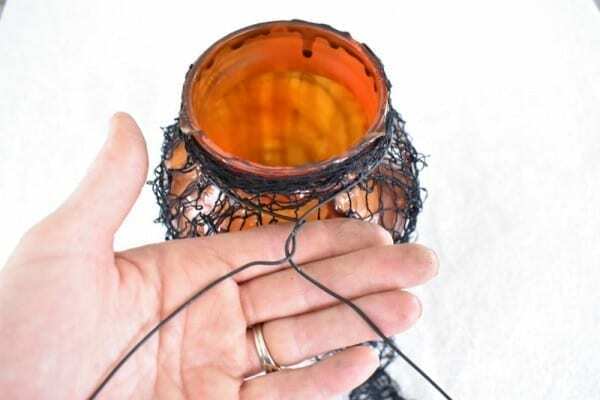 Cut a second piece of wire, attaching the ends through the first piece of wire that you wrapped around the neck of the jar. 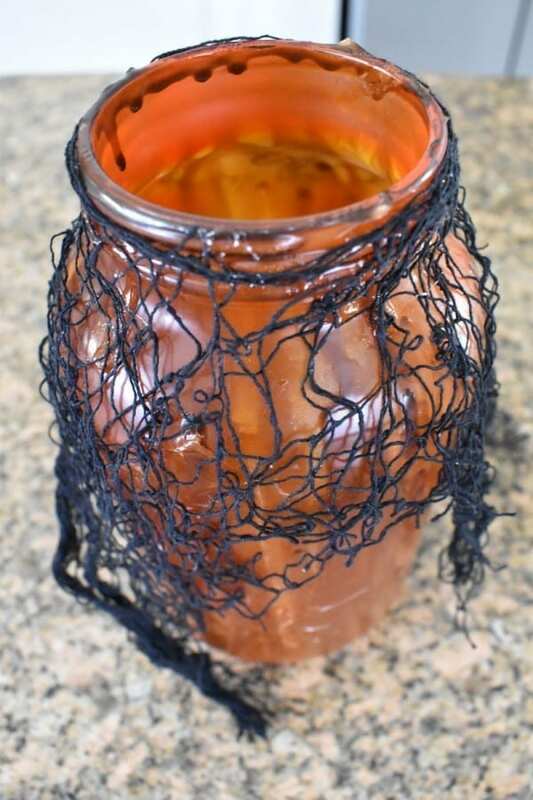 Now tighten the wire around the neck of the jar and clip off the excess. Next put a candle in and hang them up! The lanterns are beautiful, but I would suggest battery operated candles or tealights instead of the real thing. 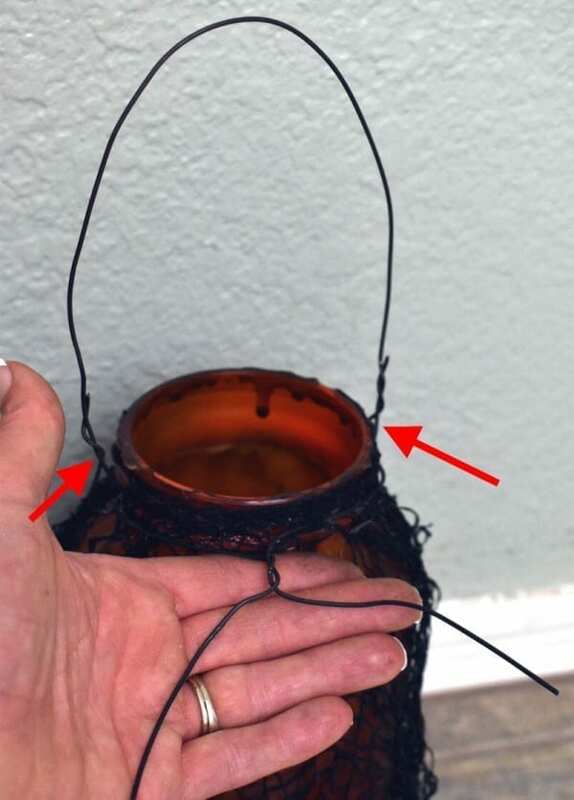 The heat of the candles could cause the lanterns to break. That’s a great idea Donna, I have some remote control tea lights that would work great! I love my lanterns! I just finished about 50 of them to line my walkway, just in time for Halloween!